Make Texas Shaped Waffles with this Texas Waffle Maker! If you are from Texas, live in Texas or just absolutely love Texas then this waffle maker was made for you! A nice, big Texas shaped Belgian waffle maker is exactly what every Texan needs in their kitchen. 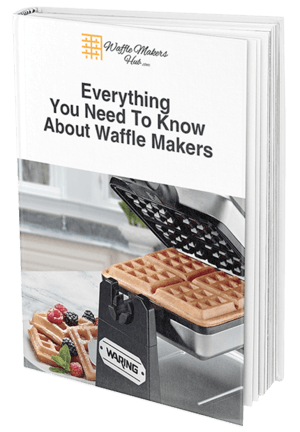 This waffle iron is a great option for all of you Texas waffle lovers, and in this review I will show you how this waffle maker stacks up. At the end we will have a big pile of golden brown, perfectly cooked Texas shaped waffles! Made of stainless steel and sold from a company out of Texas, this waffle maker is already a winner. Extra large, thick grids are designed to make big Belgian waffles and isn’t bigger always better?!? The non-stick coating promises that your waffles will not stick to the waffle iron, and at just over $43 (check the current price here! ), this Texas waffle maker is the perfect gift for anyone who loves Texas -including yourself! Keep reading for my super detailed review of the Texas Waffle Maker or check out our video below to see the machine in action! A red, white and blue box adorned with stars is the perfect package for this beautiful Texas shaped Belgian waffle maker. When I took the waffle maker out of the box, the nice stainless steel surface reflected back at me and when I opened up the machine to take a look at the plates, well, Hellooooo Texas! I have seen a lot of Belgian waffle makers and the grid on this machine does not disappoint- it really does have an extra large, thick grid! This is such a great feature for a shaped waffle iron as so many of them make thin, flimsy waffles. This Texas waffle maker looks promising! The waffle maker feels nice and sturdy, it doesn’t seem to be made cheaply and feels like a product that should last a while. Since it will be around your house for years to come, it’s nice that the waffle maker is also not too bulky and fits nicely in a cabinet. You can also store it upright as it can stand on its hinges- even better for storage! With just one light to tell you when the waffle maker is hot, this machine keeps it simple- no temperature gauge, flip mechanism, or timers- just straightforward Belgian Waffles. The waffle grid is non stick which is great for easy clean up. The orange light on the Texas waffle maker went off after about 5 minutes meaning that it was hot and ready for the waffle batter! Of course, I used our amazing waffle batter and although the handbook for the waffle maker suggested 2/3 cup of batter, a little more than 1/3 of a cup filled up all of Texas. Steam poured out of the waffle maker which is a great sign as it means the waffles are cooking and rising nicely. The handle on the Texas Waffle Maker does not latch shut but this allows the waffles to expand. You might even notice the waffle iron opening slightly as the waffles cook which is fine- it’s just the Texas waffles getting bigger and better! Should you purchase this Texas Waffle Maker? Now if you aren’t sold on the idea of your waffles being shaped like Texas every… single…time, then feel free to check out some of our other waffle makers (the Presto Flip Side is a great place to start). However, if you have read this far into the review, my guess is you want Texas waffles and you want them now! So go ahead and buy this awesome Texas waffle maker- it definitely will not disappoint!